For the third consecutive year VUZF University students visit the first technology park in Bulgaria. This time, the visit, organized by Assoc. Prof. Evgeni Evgeniev on May 17, involved 20 students in the courses "Innovation and Entrepreneurship" and "Financing of Innovation" at the University. Mr. Mihail Iliev, who is a senior business development expert at Sofia Tech Park, welcomed the students and presented up-to-date information about the innovation hub, which was built with funds from OP "Competitiveness" within 50 million Euros in 2015; in the new programming period Sofia Tech Park expects to receive additional EU funding. After that, researchers from the robotics laboratory аt Sofia Tech Park that is part of the 11 labs of the complex, nucleus of the tech park, presented their work in the field of neuro science marketing, robotics education for children, and other projects. The students also became acquainted with the function and the work of the business incubator at Sofia Tech Park and in particular they were guests of Playground Energy (http://www.playgroundenergy.com/) - Bulgarian company that sells innovative products in countries from five continents. The meeting with Mr. Hristo Alexiev was extremely interesting as he outlined the entrepreneurial culture as a key to success in business development. The students also became acquainted with the work of Mr. Ilian Milinov, co-owner of the company, who received four global awards for industrial design. Knowledge in the field of innovation and leading technologies is at the heart of the success of developed economies. VUZF University is a traditional partner in strengthening the knowledge triangle in Bulgaria - partnership between education, business and the state. 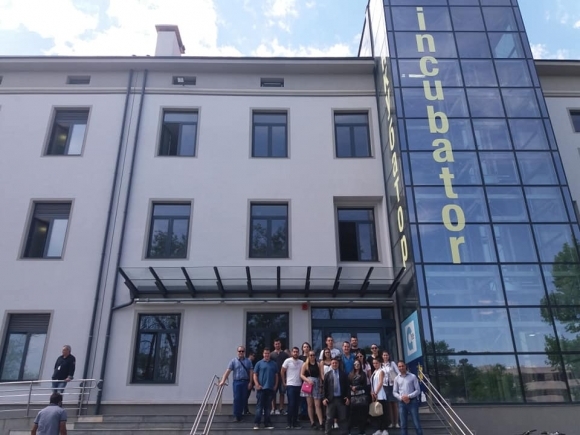 The visit to Sofia Tech Park JSC is another proof of VUZF's ambition to direct the young generation to innovative research projects that bring higher added value in the field of education and put VUZF University on the innovation map of Bulgaria. Photos from the event can be obtained here. 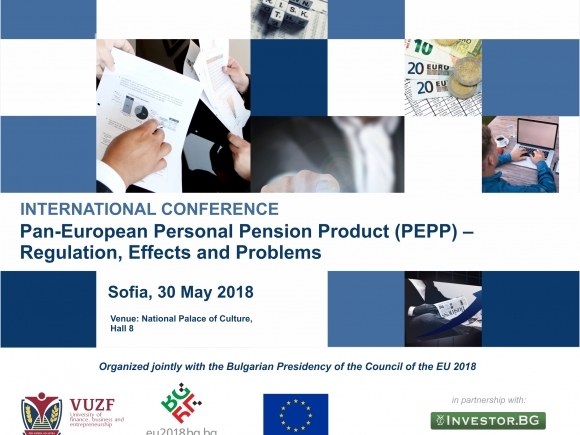 VUZF University is organizing International conference “Pan-European Personal Pension Product (PEPP) – Regulation, Effects and Problems” in partnership with the Bulgarian Presidency of the Council of the European Union 2018 and Investor.bg. The forum will take place on 30th May 2018 in Sofia. More than 140 participants from Bulgaria and Europe will attend the event. The conference is organized with the institutional support of the Deputy Prime Minister for economic and demographic policy of the Republic of Bulgaria, Mr. Valeri Simeonov, the Ministry of the Bulgarian Presidency of the Council of the EU 2018, the Ministry of Labour and Social Policy, the Ministry of Finance, the Committee on labor, social and demographic policy and the Committee on Budget and Finance at the 44 th National Assembly, the National Social Security Institute, the Association of Bulgarian insurers and the Bulgarian Association of Supplementary Pensions Companies. The forum will also involve representatives of the EIOPA /European Insurance and Occupational Pensions Authority/, the European Commission, the European Parliament, the Financial Supervision Commission, Pensions Europe, Insurance Europe, EFAMA, the Actuarial Association of Europe, the Organisation for Economic Cooperation and Development, other specialised bodies and organisations, market participants, academics, experts in the field of capital pensions and capital markets. The forum will be opened by the chairman of the EIOPA Mr. Gabriel Bernardino. Keynote speaker is Nathalie Berger, Head of Unit Insurance and Pensions, DG Financial Stability, Financial Services and Capital Markets Union, European Commission. Аmong the other main speakers and panelists are Sophia in’t Veld, Member of the European Parliament, PEPP rapporteur in Committee on Economic and Monetary Affairs, ECON who will make a video address and will interact online from Brussels and Justin Wray, Deputy Head of the Policy Department, EIOPA. The forum will discuss the aspects of the forthcoming introduction of a unified product for personal capital pension insurance in the European Union (EU) that will be performed with EU Regulation. For detailed information about the conference, please visit: http://pepp.vuzf.bg/. A visit was held between 18-20 February in Krems, Austria on the occasion of a participation in a working seminar on the project "MAGNET" coordinated by the Danube University in Krems (Austria), where VUZF University is a partner. The project focuses on entrepreneurial education and training and includes state and private universities and institutes from Austria, Bulgaria, Greece, France, Germany, Poland and the Netherlands. Ms. Detelina Smilkova, Vice President and Associate Prof. Evgeni Evgeniev, Vice-Rector for European Projects and Continuing Education, presented VUZF University with lectures on Access to Financing and Regulatory Framework: Economic, Political and Legal, which deals with entrepreneurship among migrants. On February 19, a consortium meeting was held to discuss details of the next steps to work on the project, while on 20 February a working seminar was held, which included representatives of the university environment, chambers of commerce and industry, entrepreneurs and migrants. The seminar included participation from UNCTAD through Dr. Fulvia Farinelli, who lectured on "A Handbook on Policies for Supporting Entrepreneurship among Migrants: Good Practices," while Professor Gudrun Biffl of the Danube University made a presentation on "Characteristics of Migrant Entrepreneurship". VUZF University is a member of international consortia, which succeeded in COST (http://www.cost.eu) initiative, funded by the European Commission. The project is entitled Migrant Acceleration for Growth Network for Entrepreneurship Training” (MAGNET). 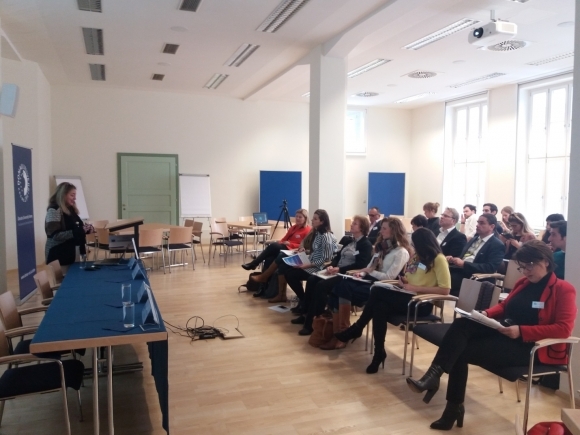 The MAGNET project is addressed to entrepreneurship education and training and includes public and private actors from Austria, Bulgaria, Greece, France, Germany, Poland, and the Netherlands. There is a growing body of evidence that (potential and future) entrepreneurs will require a different set of core competences to successfully set up and run their businesses in a changing society with changing economic and labor market situations. This has major implications for the transformation of Migrant Entrepreneurship Support and Training systems. Therefore, the main objective of the MAGNET project is to promote the creation, improvement, further development and broader dissemination of already existing support schemes for migrant entrepreneurs. This is decisive in the future European labour markets, since being self-employed and building successful enterprises (both profit-generating and social enterprises) is an important strategy to improve labour market participation especially for migrants, who are often disadvantaged in terms of labour market integration. * Conducting broad and holistic networking activities in the migrant entrepreneurship support field, both on regional and transnational level.